Titanium melts at 1,660°C and boils at 3,287°C. It is strong as steel but 45% lighter, only 60% heavier than aluminum. It is used in the aircraft industry, for artificial hips, as white pigment and in smokescreens. It is expensive. 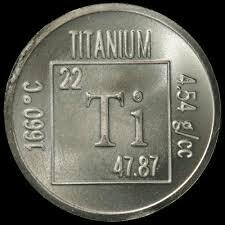 Titanium can be extracted from the minerals rutile (TiO2), ilmenite (FeTiO3) and spheen (CaTiSiO5).